I've always loved a great, hearty breakfast. Growing up, I've been used to including bread or rice (specifically garlic rice) to my early morning meals, whatever dish is served; and that rice always seemed to make eating more satisfying. But since last year, I've been trying to consistently lose weight and maintain it, and I realized rice would be one of the things I need to give up (yep, Paleo.) I found the original recipe in Simple Bites (tweaked it a bit to what's available in our pantry), made 2 batches and served it to my family. They really loved it! So I decided to include it in my weekly food plan. This is probably the easiest recipe I've done. 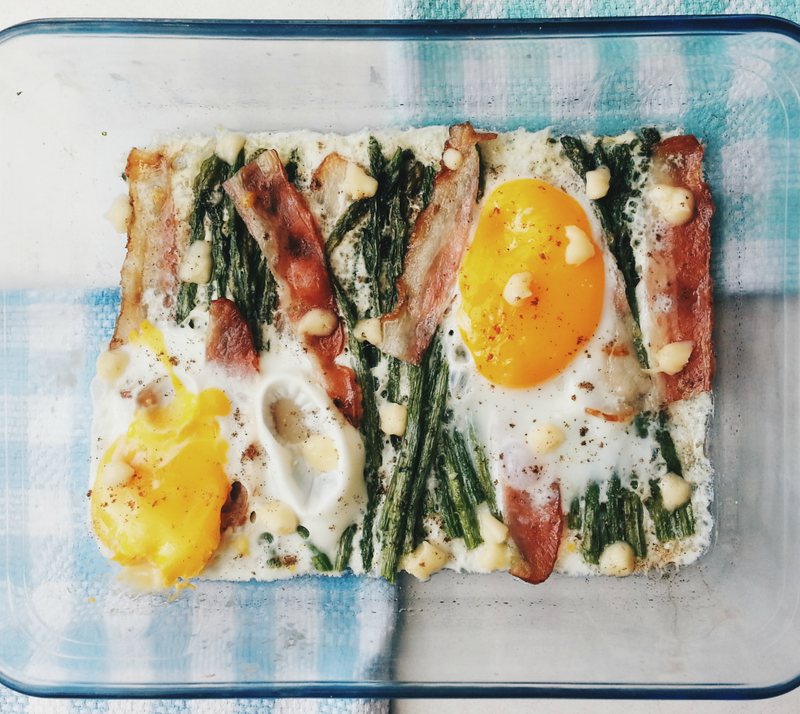 A no-fuss, throw-in-one-pan breakfast idea that I'm sure everyone would enjoy and ask for more. And doesn't it just sound and look pretty? 1. Wash asparagus thoroughly, as they may be gritty, and use a vegetable peeler to remove the bottom 2/3 of peel. 2. In a 9 x 13 roasting pan or Pyrex, lay the rashers of bacon. Place in the oven (I used a microwave) and cook for about 8 minutes or until crispy. 3. Remove pan from oven and carefully transfer the bacon to a paper towel. Drain off most of the bacon fat, leaving about a tablespoon in the pan. 4. Add the asparagus to the same pan and shake it around gently to coat the vegetables in grease. Arrange asparagus in a single layer and sprinkle it with lemon zest, thyme leaves and pepper. 5. Roast asparagus for about 6-7 minutes or until it begins to soften. Remove pan from the oven and gently crack the 2 eggs on top of the asparagus. Return the dish to the oven and roast another 3-4 minutes or until eggs have reached the desired doneness. Return bacon to the pan. 6. Sprinkle some crumbled cheese on top. Return to oven and cook for a minute or until the cheese melts. I love the colors of your food! If not for refraining red meat, I woul've dug in to the bacon! P.S. Love your blog! It's my first time here.